Kelowna waterfront real estate offers striking contemporary homes and spectacular condos lining the shores of Okanagan Lake. The pristine waters and magnificent landscape offer buyers incredible waterfront vistas. This awe-inspiring backdrop is a perfect setting for you to make your Kelowna waterfront property a reality. Imagine yourself standing on your 2000 sq ft patio soaking up the serene setting. Your private dock extends out into the glassy lake with your powerboat sitting ready for a morning cruise or an afternoon water-skiing adventure. Living by the water offers you a new way to live your life! The Vantage West Realty group is here to assist you in making your Kelowna waterfront dreams a reality. Let us help you find the best in Kelowna waterfront real estate today! 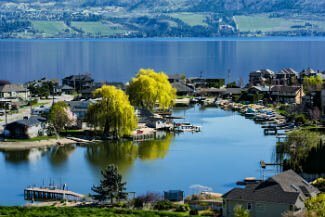 Browse all Kelowna waterfront homes for sale—simply take a look through the waterfront listings below! In addition, you can choose to continue reading about Kelowna waterfront real estate! View details on all of Kelowna's waterfront latest listings — sign up for an account today! Stunning contemporary Kelowna waterfront homes are also available to buyers that are looking for modern elegance. These homes offer designer patios to admire the breathtaking vistas and capture those one of a kind lake breezes. These luxurious homes are move-in ready. They include extravagant features that are already decided for you! Allow us to show you around these exquisite modern works of art! There is also the option of purchase charming waterfront homes that have the structure you want with an interior ready for you to personalize. The addition of hardwood flooring, modern appliances, and a fresh coat of paint can do wonders for the space, not to mention instantly increasing the value of your new home. You could also take the renovations a step further and extend the patio space to take advantage of incredible spring and summer entertaining opportunities. Kelowna waterfront condos for sale offer buyers’ maintenance-free lakefront living at its best! Whether it is a luxurious penthouse condo with a wraparound balcony, a well-loved condo looking for some updating, or a townhome that gives you the best of both worlds in lakefront living, Kelowna waterfront real estate has you covered! Kelowna luxury condos provide buyers with gorgeous interior space complete with hardwood flooring, hot tubs on the balcony, tall ceilings with plenty of windows to frame the splendid view, and high-end kitchens open to the living space. These condos range in styles from modern contemporary spaces to a more urban décor offering a cozier setting. The exciting prospect of purchasing a condo by the water and customizing the interior space is appealing to many buyers. The view is something you can’t change, so when you find the right outlook with good bones you can go wild creating your dream space! Regardless of your requirements for Kelowna waterfront real estate, the Vantage West Realty group is here to help you with your search. We will provide you with details about the surrounding communities, inform you of the types of homes available in your price range, and answer any other questions that you might have during your home search! Call Vantage West Realty group today! Whether you're looking for a great investment property, lavish luxury estate, or the perfect home for your golden years, let us make your Kelowna real estate search simple and stress-free! Contact the Vantage West Real Estate Group online or give us a call at 250-717-3133 to get started.